Please join the Power of Pain Foundation team and choose the “I Wish to BE…ORANGE” category. Orange being the awareness color for chronic neuropathy pain. Our team goal is to raise $1,000. We would love to exceed that! We have raised $300 and there are 55 days left. and choose who you would like to donate and support. Thank you for supporting Make-A-Wish Arizona. Your contribution is greatly appreciated. Thank you also for your consideration! This poem is dedicated to all my RSD/CRPS brothers and sisters. It was written only a few months ago. For many years I had a popular poetry site called Golden Rainbow Poetry and became Golden Rainbow Poetry Creations as it evolved. I had a small business license back then under the same name. Many of my poems have been lost, some have been found and others are hopefully backed up on a drive I have not located yet. From my earlier years of writing there is a journal type book somewhere that has dozens hand written in. I am hoping it is in the garage in a box. Soon I will begin to share the ones I do have available. Some have been published in both hard print and audio, in hard bound compilations of 100’s of poets together in 1 book, 4 of my poems live inside those, others on various internet sites. I wrote a poem for 911 that is on audio. The project was published as both hard bound book with an audio CD, mine made it to the audio part. Each of my poems have a mood, some in imagery that leaves the reader to wonder the meaning and also to connect with the words themselves. Some of these poems could come from the reader themselves. It could be anyone, anywhere and at anytime. It is still Nervember (November) National RSD/CRPS Awareness Month. 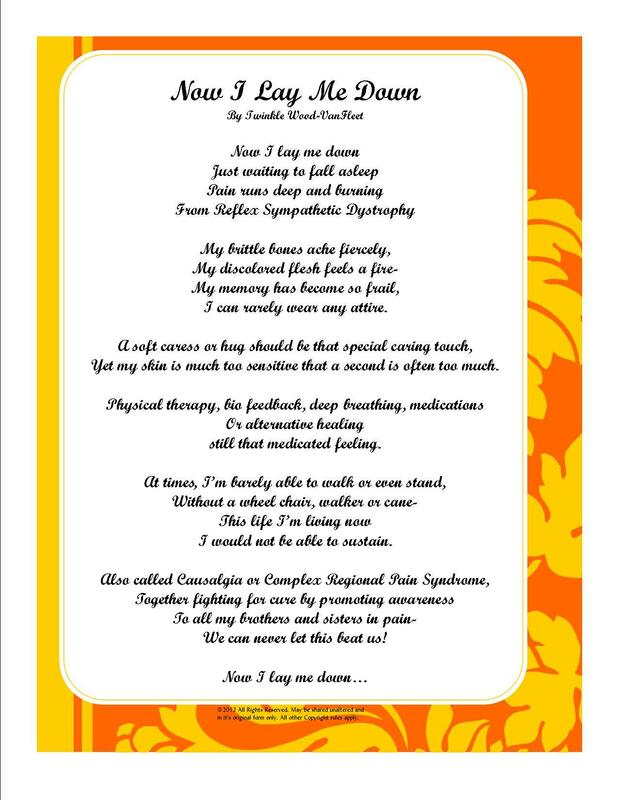 I hope the poem above brings a bit of awareness to those who can’t seem to grasp the meaning of RSD/CRPS. Or… What it feels like. A special thanks to Barby Ingle, Trudy Thomas, Chris Greulich, and the Power of Pain Foundation. Thanksgiving is less than 2 days away. I have much thanks to celebrate. Especially for the having the very best husband in the world, my children, grandson and the fire in my flesh and bones I survive however hard. I am thankful for those friends mentioned above. I am thankful for my mom, sister and extended family. I am thankful for being here to help others, I am thankful for those who help me. NERVEmber (November) is National RSD/CRPS Awareness Month! November is our nationwide Reflex Sympathetic Dystrophy (RSD), Complex Regional Pain Syndrome (CRPS) Awareness Month! The Power of Pain Foundation calls this Nervember. There’s 2 meaning’s behind it and I hope that I’m explaining it properly. Nerve of course would be for nerves, and the nerve pain and/or damage we experience and ember, coals, fire, what our pain feels like. Barby Ingle Executive Director of the POPF explains during her hour long interview on the Living with HOPE Radio show Monday October 29th, 2012. The episode is still availabe in the archives to either be listened to from Blog Talk Radio or by download. Barby also discusses several upcoming events for Nervember. Including a full day 6th Annual Arizona State Management Conference Webinar November 3rd, 2012. For a really great blog, don’t forget to visit: Patient Awareness by the Power of Pain Foundation at www.PatientAwareness.org featuring writer and editor Chris Greulich. Still in it’s infancy, born only a few months back, you won’t want to miss this one. It’s growing by leaps and bounds. So much more pain and patient related information to come. Please support a loved one, friend, colleage, or even an acquaintance that you know who may be suffering from and attempting to survive this painful and debilitating neuro inflammatory auto immune disease. Even those you don’t know need your support. We ask that you wear Orange as many times as possible throughout the month of November. Whether it be an awareness bracelet, clothing, anything. 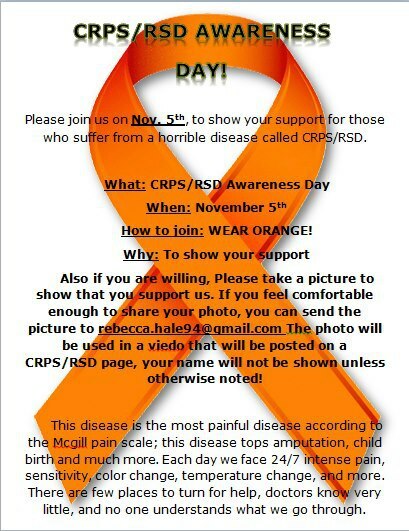 If you don’t have anything on hand, you can get into the spirit with us by making yourself an orange tag that say’s “I Support RSD/CRPS Awareness” or “I Hope for a Cure for RSD/CRPS”. Use your imagination, we’ll be thankful to you! Don’t forget to tell everyone that you know to wear orange too and why. The more people you teach and who become educated in why we’re doing it can pass on what they’ve learned to the next person while wearing their orange and that person to the next..
and that person to the next.. If we all take part soon enough more and more people out there will become familiar with the words.. the letters..
Then we can rest easy and begin again. What are you doing to this month in the name of RSD/CRPS awareness? Would love to hear from you!